First done – Joy Formidable last night. They’ve been away a while, I think record company issues account for this, but they’ve still got it. Really give it everything on stage, for a pretty small, reserved crowd. Great start to the gig year. Enjoyed Du Blonde a lot more than I thought I would. Back story: I have a mate and we have an agreement to always say yes to one another’s gig choices – only allowed to say no if there are previously booked engagements. I’ve seen some great stuff that I wouldn’t have gone to otherwise. Nothing booked in till May now – Loyle Carner and LANCO in one weekend. Did anyone here go to Black Deer festival last year? Thinking about going this year and just wondered what it was like? Busy? Camping ok? Etc? Am also interested in this as it is close to us. @deadlydarcy – i guess you’re a Country fan? When Luke Combs tours the UK next you should go see him – we saw him twice last year and he’s amazing live. Sleaford Mods are bloody brilliant live! Brian Downeys’ Alive and dangerous last weekend… brilliant. Indeed they are. Not being a “I saw them before they were famous” type, I won’t* mention that I saw them in a pub the first time and Jason’s anger and ticks were a sight to behold up close I can tell you! Especially as I went not knowing at all what to expect. Fabulous. Booked to see Swindle at Fiddlers, Brizzle. Max capacity 450 – I like it. Only £14 as well. The only gig I’ve been to so far this year was the Virginmarys at The Underground in Stoke last week. Great night, as always with them! First done – Joy Formidable last night. I wanted to see them in Bristol, but it’s difficult to match gigs with my work hours – alternate weeks I finish at 7pm, doors open time! Buggerit. They seem to be coming back later in the year, so I’ll try to get tickets then just either take a day off, or switch my hours if necessary. Big Thief are playing Bristol as well, I’d like to see them again, and I’ve got my Piroshka tickets! Their playing Rough Trade, and it’s a Saturday, so no issues with hours. Ah reminds me, I’ve got Suede coming up with mrs dd. Quite looking forward to that too. Oho – tickets for Sleaford Mods in Brizzle still available. CountZero sed> Their playing Rough Trade, and it’s a Saturday, so no issues with hours. What’s RT like as a venue? I’ve only been in the shoppe below. Who’s in flippin Bristol then? Since I last posted – I’ve seen the excellent Beans On Toast in Truro, a great gig that ended pretty shambolicly, but was awesome because of it. Also saw She Drew The Gun at the Fleece in Bristol. Who were a little disappointing to be honest – I expected them to be angrier live. Going to see Alice in Chains tomorrow night, can’t wait to hear Nutshell live. Went and saw Art Brut last week. Accidentally got pretty shitfaced, made it home at 3am, had to walk to work because I was blatantly still drunk. I still feel weakened. I love Art Brut but damn it Eddie. 3 massive nights in London this weekend, getting on a train at 10am, to see the Hold Steady, and the Hold Steady, and then on Sunday also the Hold Steady. SO! MUCH! JOY! Usually plenty more once the festival season has started. I’ve only been to one this year, unfortunately, and it wasn’t a “gig” as such, but Sarah McQuaid at The Bridge Inn at Topsham. Very good, chilled & relaxing. Especially when combined with cider! Just got back to the hotel with my ears still ringing from seeing Halestorm, absolutely awesome show. Small venue, mental crowd, volume all the way to 11. If you like rock and they’re playing near you, don’t miss them. Saw Steely Dan at the Manchester Arena three weeks ago. Amazing to hear live at last the songs I’ve been listening to for 40 years and they didn’t disappoint. Sadly Walter Becker is dead but as long as Donald Fagen is there it still sounds like Steely Dan. Next gig will be ABC at the Bridgewater Hall complete with full orchestra playing the Lexicon of Love in its entirety. Anne Dudley from Art of Noise who co-wrote and arranged the album will be playing with them. ’d love to have gone to see Chris Stapleton – but I’m away most of the week preceding on a boys ski/snowboard trip so there’s no way heading off to London for a gig was going to fly in my house. Enjoy, looks like a great weekend. Will you be doing double denim? Chris Stapleton was pretty amazing – proper no-frills performance, just him, his Mrs, a Baas player + Drummer. Highlights from C2C were Cam, Keith Urban (i was expecting him to be a bit ‘style over substance, but he was very good) Ashley McBryde and Stapleton. Have booked tickets for Hawkwind’s 50th anniversary tour for the Albert Halls in Manchester. TBH I begrudge giving the thieving space monkey a penny, but there a 50% chance it might be good. Obviously, there’s a 50% chance they’ll be as stoned as badgers and it’ll turn into a tedious embarrassment, but I’m happy to take one last gamble. Just booked for Emmy The Great, 10th anniversary tour of First Love which is one of my favourite albums ever and was also kind of the soundtrack of me getting back into mountain biking. Can’t wait tbh. There’ll be on here going to see Mac Demarco at the Piece Hall? Not exactly underground any more. Really good venue if the weather is okay, which it always is in Halifax. It was for last year’s (fantastic) Father John Misty event anyway. NW, how was your The Hold Steady weekender? Oh, and booked to see Sleaford Mods in Brizzle. Next gig is Swindle tomorrow week. saw The Dub Pistols … again on friday and will be watching new comer Pip Blom later this month or next? Also UK subs and Pigs x7 in April. Going to see PWEI, Neds and Miles Hunt in April. Have seen PWEI countless times back in the day but that was with Clint. Not really sure what to expect but thought I’d give them a go. 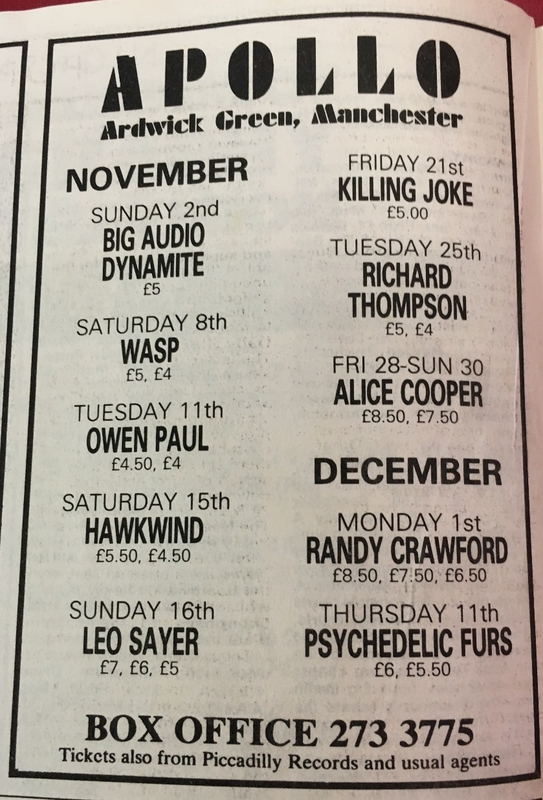 ’86 was a damn good year – went to B.A.D, Hawkwind and Killing Joke. Schoolly D supported B.A.D, cue lots of very confused Mancs getting their first taste of live Hip Hop . KJ’s support act failed to turn up and they sent some random bloke with an acoustic guitar out as a substitute. The acid kicked in just before KJ came on and it was an absolutely fantastic, if slightly scary do. Used to go to gigs every week back then, remember Here & Now, Easterhouse (friends of friends) and possibly Trouble Funk from that year too. Dance music was starting to fascinate me, used to go Rock World and The Banshee with one group of mates and The Red House in Royton in Oldham to listen to Hip Hop. Seventeen, it was a very good (and very eclectic) year. Well I suppose we made it to page 4 before Spanner started talking about a gig he went to 76 years ago. That’s quite good going. NW – glad you enjoyed. I was seeing a lot of stuff about it on twitter over the weekend and having to pretend I wasn’t missing the whole thing. All sounded great. If it’s happening next year, I’m not **** missing it again. Starting to get very excited about Doves in a couple of weeks*. I think I might shed a tear.